ASCE’s 2017 Infrastructure Report Card, released Thursday, offers the nation both bad news and good news. The bad is the average grade, D-plus, has not changed since the last Report Card four years ago, reflecting a continued dire need of overhaul. The good news is the Report Card says such an overhaul is still attainable, and offers suggested solutions that can make that overhaul happen. While the overall infrastructure grade remains unchanged since 2013, seven of the 16 infrastructure categories assessed did see improvement – hazardous waste, inland waterways, levees, ports, rail, schools, and wastewater. Rail received the highest category grade – earning a B. Transit, meanwhile, received the lowest, a D-minus. A team of 28 civil engineers from across the country with decades of expertise in all 16 categories prepared the Report Card. 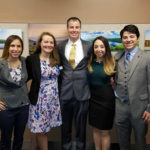 ASCE’s Committee on America’s Infrastructure amassed and assessed all relevant data and reports, consulting with technical and industry experts, and assigning grades using the following criteria: capacity, condition, funding, future need, operation and maintenance, public safety, resilience, and innovation. The Infrastructure Report Card recommends three key steps toward raising the grades. 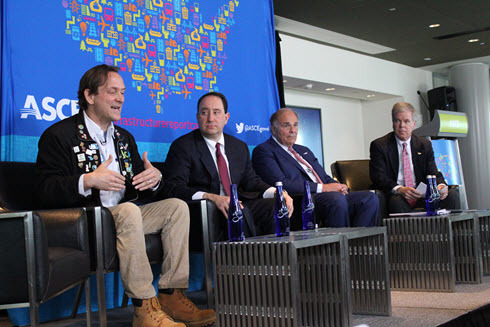 Greg DiLoreto, P.E., P.L.S., D.WRE, Pres.13.ASCE, former ASCE president and current chair of the CAI team that assembled the Report Card laid out the solutions at the release event: “… We are underfunded in our infrastructure, so the No. 1 solution is that we have to increase our investment in infrastructure, and we have to do that at all levels – at the federal, at the state, and at the local level. It has to be increased. George Hawkins, CEO of DC Water, speaks during a panel discussion at the release event for the 2017 Infrastructure Report Card. He’s joined by, from left, Drew Greenblatt, CEO of Marlin Steel Wire, former Pennsylvania governor Ed Rendell, and ASCE’s Casey Dinges. Investment, leadership, preparation for the future. Each is intertwined to the other, but it all starts with money. ASCE estimates that the nation’s infrastructure needs a total of $2 trillion across the 16 categories through 2025. 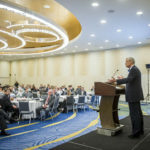 The Report Card estimates that a failure to do so – what Rendell called “the cost of doing nothing” – would cause a $3.9 trillion hit to the gross domestic product by 2025, $7 trillion in lost business sales by 2025, and 2.5 million lost jobs by 2025. 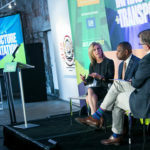 Joining Rendell on the panel were Drew Greenblatt, CEO of Marlin Steel Wire, who made the business case for infrastructure spending, and DC Water CEO George Hawkins, who talked about the value of innovation and forward-thinking when it comes to building the next generation of utilities and infrastructure. Connecticut Gov. 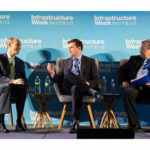 Dannel Malloy, who has pressed successfully for infrastructure investment in his state, also appeared at the release event and related various challenges and successes from his state’s perspective. 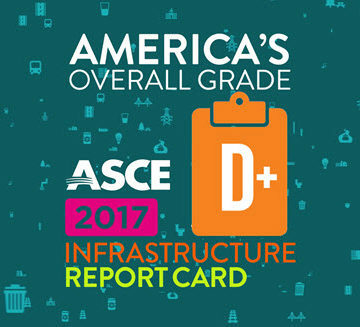 Additional information regarding the Report Card, category grades, and state Report Cards and information, as well as infographics, videos, and other resources, can be found on www.infrastructurereportcard.org or via the Save America’s Infrastructure app in the Google Play and App Stores. Is there a way I can get a file of the 2017 Infrastructure Report Card?